Getting your engagement ring repaired after an accident or due to simple wear and tear over time is not a task to be taken lightly. The sentimental value of the piece as well as its financial worth requires precautions to guarantee proper mending. 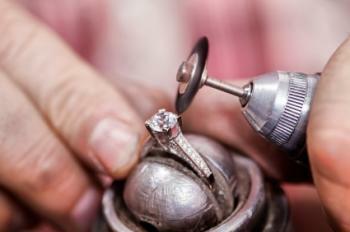 Ideally, your engagement ring should be repaired by the same jeweler who created it. They will be familiar with the type of metal as well as any patterns or designs, and can most efficiently care for the piece. If that is not possible, however, choosing a jeweler should be done carefully -- investigate them before entrusting your engagement ring to their repairs. Ask about their repair experience, as well as their work with your particular type of metal and gemstone. Most engagement rings are delicate creations with intricate details on the band and setting. Each part of the ring -- the stone, the setting, and the band -- is subject to everyday stresses that could require repair. Diamonds may be among the hardest known substances, but they are not impervious. Other gemstones are typically even softer than diamonds and can also be damaged. Luckily, most damage to jewels is fairly minor, such as light scratches or small chips, and can easily be polished away. Gems with flaws and inclusions, however, can become damaged more easily than higher quality stones, and could even fracture or split under certain conditions. In some cases the flaws can be repaired with filling or coating treatments, but that may be impossible. In that case, the stone must be replaced. The remnants of the original stone can be saved, and it may be possible to use them to create a ring wrap to upgrade your ring at the same time. The setting is the most frequently damaged part of an engagement ring. Tiffany or prong settings in particular are prone to twisting, warping, or shifting that can loosen the stones. For minor repairs, the setting can be repositioned to provide a secure fit, but in other cases it may need to be replaced entirely, perhaps with thicker prongs or a more durable metal such as platinum. The more intricate the setting, the more prone it is to damage. Pavé setting engagement rings, for example, commonly lose the small accent stones that coat the band because the setting is not designed for maximum security. Antique engagement rings also frequently have damaged settings or missing stones because of the difference in craftsmanship and metal durability when compared to modern rings. If worn frequently, every engagement ring's band suffers minor nicks and scratches. While these marks of daily wear are not necessarily detracting from the ring's beauty, they can be polished away if desired. Deeper marks may require the ring to be recoated. White gold engagement rings need periodic recoating with rhodium to preserve their white luster, and silver engagement rings may also need regular polishing. 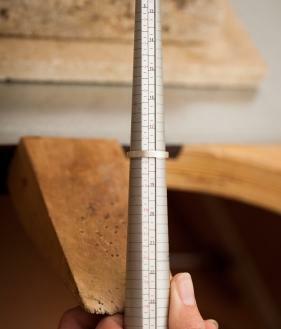 If the ring's band becomes stretched or warped, it will need to be reshaped. Stronger metals such as platinum are less prone to warping, while softer golds (higher karat values) warp more easily. If your ring has warped, always have the jeweler double check the setting to be sure no stones have loosed during the trauma. A loose ring is more easily lost or hooked on small obstacles that could cause greater damage. A tight ring becomes uncomfortable, disrupts circulation, and may need to be hastily cut off in a medical emergency. The more intricate the ring, the more carefully it must be resized. If the ring is too loose, you may want to consider adding a spacer first. This is a small piece of plastic or metal that attaches discreetly to the interior of the band and effectively decreases the size without permanent changes. This is the perfect solution if you feel your weight may rise again, making additional resizing unnecessary. Plain ring bands are the easiest to resize, requiring only to be stretched with a bit of additional metal added. If the band is detailed, etched, or engraved, those details may be hard to preserve. Before resizing a ring and destroying some of its sentimental charm, you may want to consider purchasing a replacement or upgrading engagement ring. Never attempt ring repairs yourself, no matter how simple they may seem. Without the proper tools and expertise, you can inadvertently cause more damage, perhaps irreparably. After your ring is returned, carefully gauge the quality of the repair. If you are not satisfied with the workmanship or changes -- for example, a new set of prongs may be too thick and overshadow the gem -- do not hesitate to speak up and demand satisfaction. The jeweler should be able to rationalize and explain any changes (increased strength, impossibility of finer repairs, etc. ), but ultimately the choice should be yours. When you bring your engagement ring to a jeweler for repairs, always provide them with as much information as possible: the type of metal used, any imperfections in the stone, and any special considerations that should be made such as something you do not want changed. If possible, furnish them with a copy of the lab certificate with all the ring's information. To protect your investment, inspect your ring carefully before leaving it to be repaired -- you should be familiar with any marks on the band's interior as well as with the physical appearance of the stone. Unscrupulous and dishonest jewelers may attempt to replace your ring with a less valuable one, but being intimately acquainted with your ring's peculiar characteristics will prevent such a scam. Many women fret over damage to their jewelry, but repairing your engagement ring does not need to be intimidating. By carefully investigating the jeweler and clarifying your wants and needs, your engagement ring can easily be restored to its former brilliance.